I stayed with the Italian theme yesterday, having enjoyed the Insalata Caprese for lunch, and went in search of a good gelato when I went into central London late afternoon. I was going to see Three Days in the Country at the National Theatre in the evening. Patrick Marber’s version of Turgenev’s play has been receiving some outstanding reviews. I saw the original Month in the Country many years ago. Marber has cut the play almost in half – hence the change of title and it running for just over 2 hours instead of the original 4. I enjoyed it; it was good and entertaining but rather agree with Michael Billington in the Guardian who wrote that ‘it sacrifices Turgenev’s crucial contrast between the genteel languor of country life and the desperate passions beneath the surface.’ For me, it slipped too often into almost farce overshadowing the tragedy at the heart of the story. Back to gelato! London has become a mecca for great ice cream over recent years. There’s the wonderful Gelupo which I’ve written about before, but gelaterie are popping up everywhere. It was while I was enjoying a cup of some of the best gelato around in my local Gelateria Danieli in Richmond last weekend with Lucia and other friends that Lucia said it was as good as Scoop’s. She added that the ice cream in London is so good now that sometimes she’s disappointed when she goes back to Italy. I decided I must take a trip to Scoop if Lucia liked it so much so checked out their website yesterday (click here) and found there was a branch in Covent Garden. Perfect! It’s very quiet locally with many people away on holiday; the roads and shops are almost empty. But it’s quite a shock to arrive in central London and find it heaving with tourists and families out for a day during the school holidays. I almost wanted to go home! It was too much. 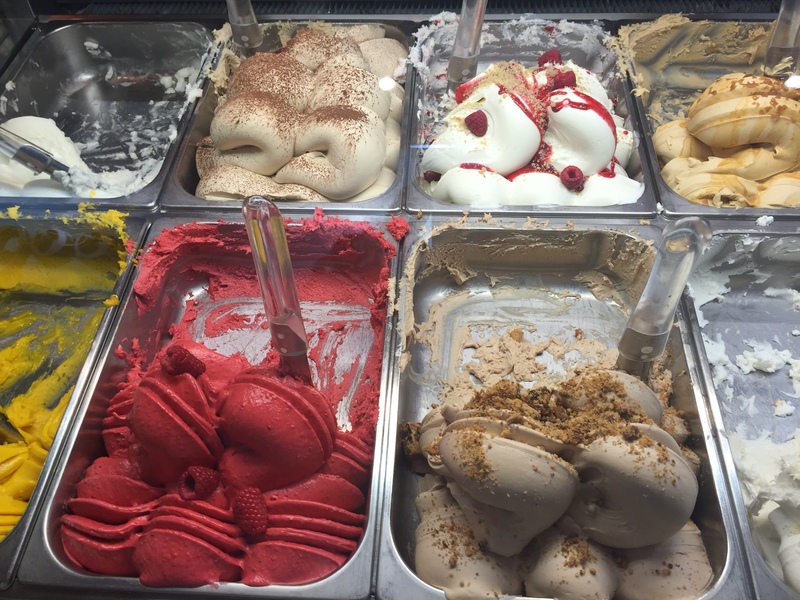 But I had a play to see and I’d come in time to make my way across the river from Waterloo station into Covent Garden in search of that great delight in life – a good gelato! Would there be a queue? 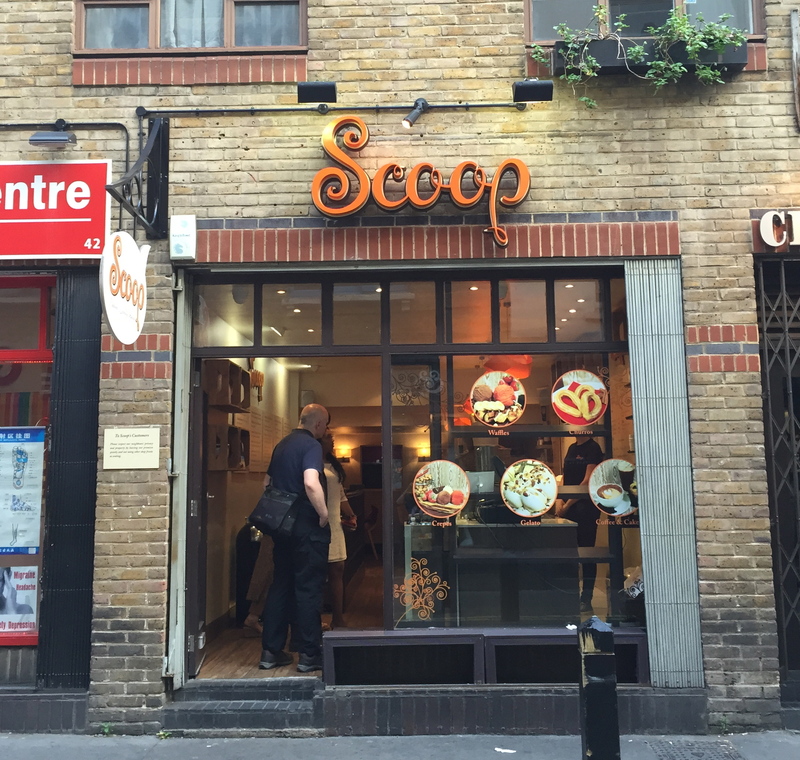 Scoop’s branch in Short’s Gardens, just off Neal Street in Covent Garden, was the first of three (the others are in Soho and South Kensington). Luckily when I arrived there was barely a queue at all. Inside I considered the flavours and what I’d have. Did I want Baci with hazelnuts from Piemonte? Pistachio made with what are said to be the best pistachios anywhere, from Bronte in Sicily? 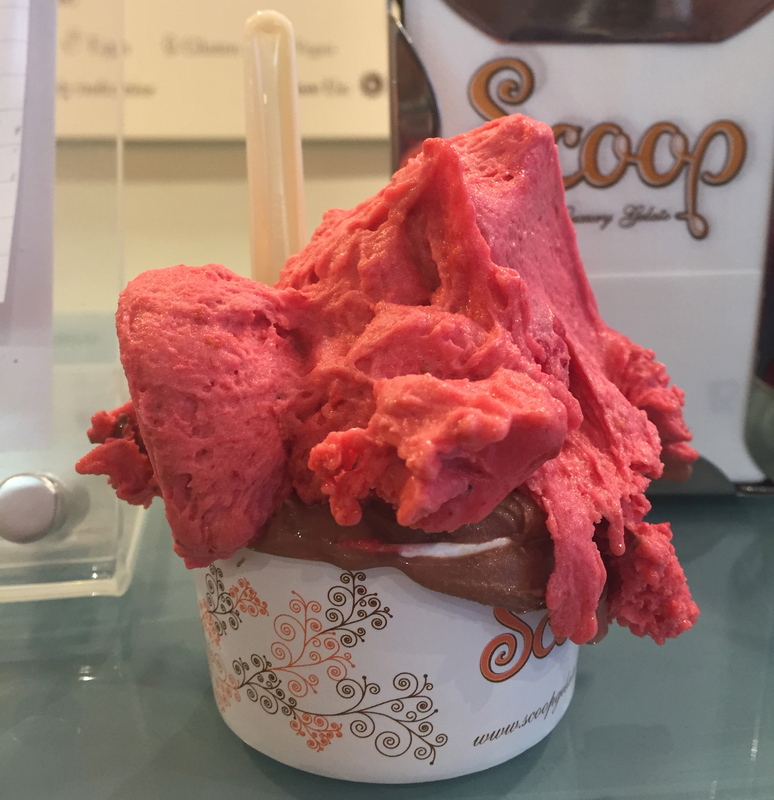 Scoop pride themselves on their natural flavours: ‘The colour of our gelato is natural and the cold is our only preservative.’ I went for two of my favourite gelato choices: chocolate (cioccolato extra fondente) and raspberry. I chose a small cup for £4 which allowed you two choices of flavours. It was a very generous serving so I was glad I’d been restrained! I would love to have some of that Gelato. My favorite Gelato is Hazelnut.